To mention just a few, Karen Loughridge of KLArt whose words of encouragement and inspiration are ever flowing during times of doubt, Aunty Suzie (Now a happily retired Graphic Designer) who encouraged and offered creative support throughout my university years, Mick Baxter for staying with me and encouraging me in my photography through thick and thin, Andrew Devis of tale2tell for his words of wisdom and spiritual encouragement, and also Brian Nelson of Encaustic Art Plus, He knows fine well the devil of torment and has experienced the very same firestorms as myself, yet he also come out the other side fighting. Brian was the inspiration behind me setting up business trading as Elevatedby which provides services in Photography, graphics and website design through computer creativity. Lets set our minds back to 29th and 30th December 1940. This may seem a little off topic, but please do bear with me as the metaphor unfolds. On these two nights from 6:00pm till the early hours of the morning over 24,000 high explosive bombs and 100,000 incendiary bombs were dropped on our Capital City of London. More than 160 civilians died during those two nights and many more died later due to injuries sustained. Buildings were completely destroyed including 19 churches, 31 Guild halls and all of Paternoster Row (which was the centre of London’s publishing trade). 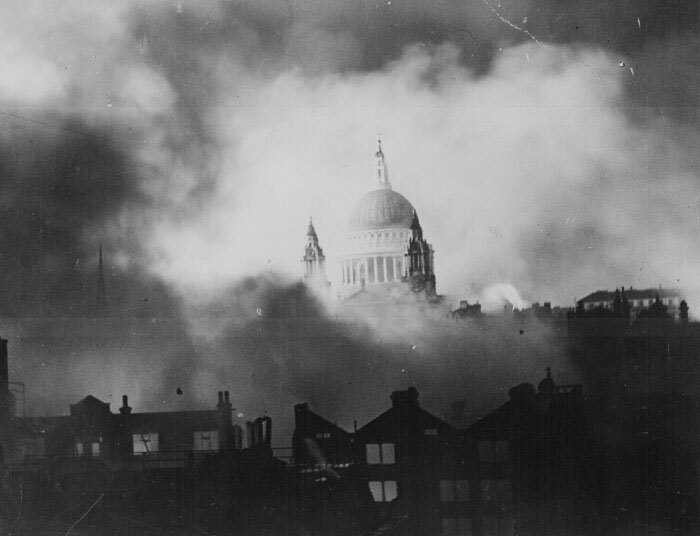 Many of you will have seen the above photo of St Pauls’s Cathedral standing firm and peaking through the smoke and flames of the firestorms during the Blitz of London in the 2nd World War. The image was beamed all around the world and it portrayed a unbroken London, defiant and determined to survive the German Luftwaffe’s onslaught. 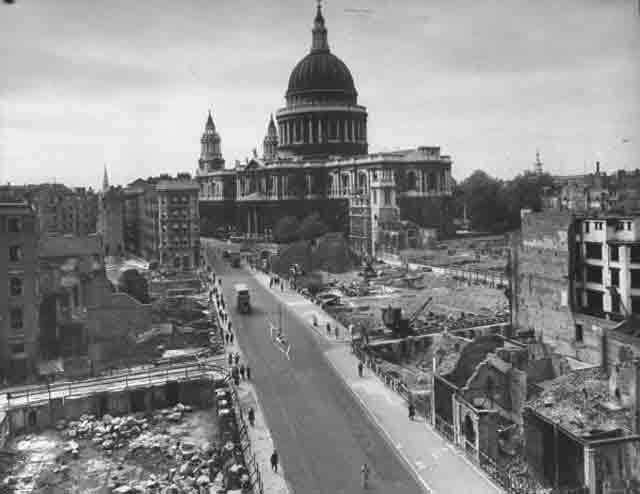 After the War St Paul’s Cathedral became the symbol of survival for the British people. I’m sure I speak not only for myself here, but also many others who spend their lives overcoming adversities. I like to think of myself as the St Paul’s Cathedral in that photograph. Standing firm in the firestorms, defiant and determined to carry on no matter what may surround me. What many people don’t know is that this image is a crop of an original which is very different, and looks something like the above. It is an image that shows fallen buildings in a severely broken and devastated Capital City, tough huh? I’m speaking now on behalf of anyone who has been the victim of some form of abuse, whether it be physical or verbal, yet despite being able to put on a brave face, the reality of what that person is going through is more like the un-cropped image above. An image of devastation caused by the firestorms of verbal abuse and the high explosive forces of torment, which if left unseen and un-noticed can leave a person on a crumbling and devastating path of demoralization and self doubt. Periodically in posts to follow over the coming weeks, I will reveal snippets of what is all too often ‘cropped out’ by a brave face and hidden from public view, sharing first hand accounts of being exposed to the burn of the firebombs of verbal abuse and firestorms of torment. In the same posts, I will share with you how through creativity I was able to snub out some of the firebombs of verbal abuse, extinguishing the firestorms of torment, and how creativity gave me the strength and determination to stand firm and strive ever upwards in the face of the adversity of living with a disability. Stay tuned!